I had written out our weekly menu earlier in the week, but for Wednesday I had written “Random”— aka I had run out of ideas for what to make for dinner, so I thought I’d figure it out later. Random Night had arrived, so I searched on foodgawker, and scrounged around in our pantry and fridge looking for inspiration. 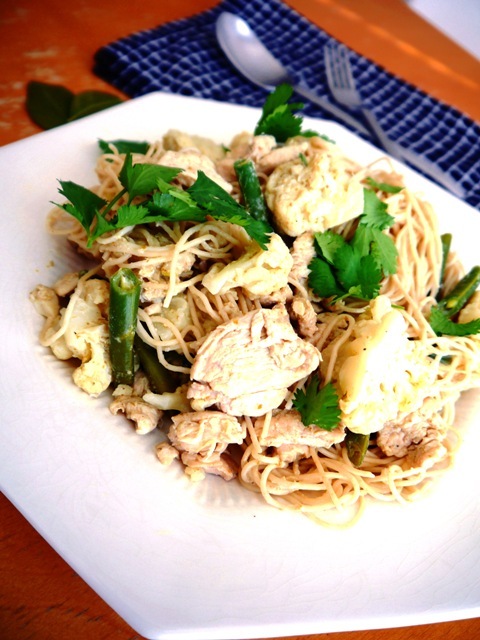 I had some Thai green curry paste, spaghetti noodles, cauliflower and green beans. I didn’t want to do a full on traditional Thai green curry since I was missing the veggies that go in it, and my Thai hubby isn’t a huge fan of curry, so instead I decided to do a quick Thai green curry over spaghetti noodles. I decided to use spaghetti noodles instead of rice noodles since my Thai hubby prefers these Barilla Protein Plus Spaghetti because he loves to work out and likes how they have 17 grams of protein to make his muscles big and strong. But feel free to use whatever pasta or rice noodles you have on hand that you like most! The Thai green curry ends up being a light sauce to put over the noodles, but if you want it more soupy, feel free to double the coconut milk, and curry paste. 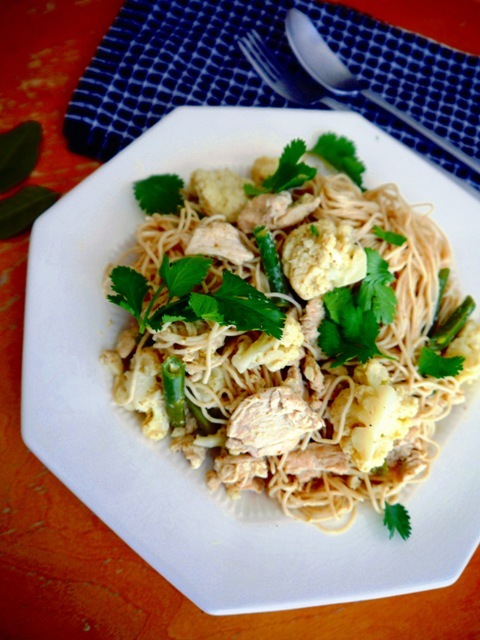 Our sunny Austin weather has been cold and dreary lately, so this Thai Green Curry Chicken Spaghetti felt like ray of summer sunshine in the midst of our cloudy winter days! And the extra bonus was that it was quick to make, and as all curries do, it tasted even better the next day! Yay for Random Night inspirations! 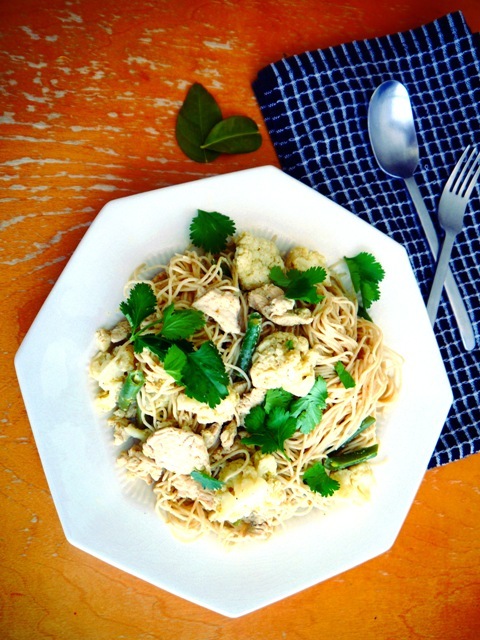 This is a great way to eat Thai green curry for a quick week night dinner! Cook the spaghetti noodles according to box instructions. While noodles are cooking, warm oil and 2 tbsp. of green curry paste in a large wok or saucepan over medium heat. Stir until the curry paste has incorporated with the oil. Stir in the veggies and coconut milk, and add another tablespoon or so of green curry, to your liking. Cook until the veggies are tender-crisp. Turn off the heat and feel free to adjust the flavor to your liking. If you want it spicier, add more curry paste, more savory add some fish sauce, or sweeter add some sugar. Put some noodles on a plate, dish the curry on top and sprinkle cilantro, and the kaffir lime leaves over it. Enjoy! This is a flexible recipe, so feel free to use other veggies, meat or noodles that you might have on hand! What a delightful blog. Our son lives on Phuket with his Thai wife and is loving the food and her. We are just learning about Thai food and culture and are addicted to both. I will be visiting your blog often. Thank you for your enthusiasm, and sharing spirit. Thanks so much for your comment Jeanie! I love that you all are now addicted to Thai food and culture thanks to your dear son and his wife! 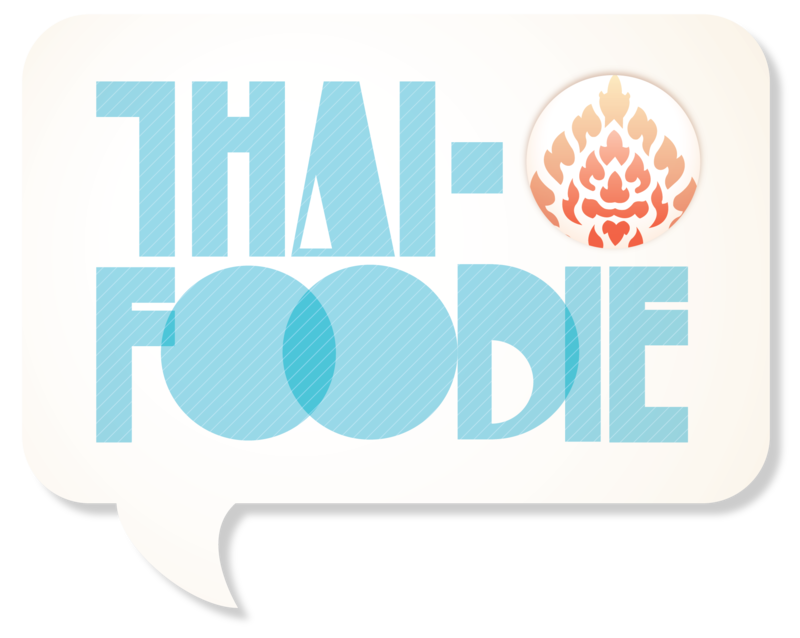 It’s my pleasure to share my stories and recipes with you all and help you connect even more with your Thai daughter-n-law!